All classes are taught with positive and motivational techniques. We use toys and treats at all levels of classes. Junior handlers age 12+ are welcome. Obedience classes give you the tools to train toward the goal of having a well-mannered companion who is part of your family and a good canine citizen. Agility is a great way to build a tremendous bond with your dog and have a super fun time as well as provide an outlet for the enterprising dog and the one who needs confidence building. Four-week session which blends basic training and lecture/tips on raising your puppy. Includes introduction to Clicker training, recall (come when called), sit, sit for dinner, down. Pre-requisite: Under the age of 14 weeks at start of session, vaccinations appropriate for age of puppy. Six-week session which includes introduction to Clicker, sit, sit for dinner, down, recall (come when called), sit/down stay, loose leash walking. Pre-requisite: 16 weeks of age, proof of rabies vaccination, vaccinations appropriate for age of dog/puppy. Six-week session which builds on the foundation from Beginner Obedience. Includes sit and down on voice cue only, sit and down with hand signals, stay with distractions, stand, heeling/loose leash walking. Pre-requisite: Beginner Obedience. 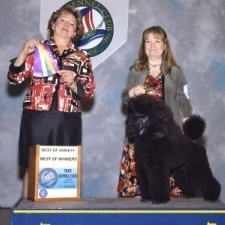 Six-week session works on all skills required for Novice, Open and Utility Obedience Competition. Pre-requisite: Advanced Attention. Six-week session that builds on fundamentals of Beginner Attention. Helps you perfect your footwork with more precision. Works off leash heeling and stays. Prerequisite: Beginner Attention. Six-week introductory course to agility. Dogs and handlers will learn the basics of all agility equipment. We will also cover foundation skills to navigate the equipment as a team. Pre-requisite: Advanced Beginner Obedience or Advanced Attention, dogs must be at least 12 months old. Six-week session of agility specifically for conquering contacts and weave poles. Weaves & Contacts will teach your dog how to navigate the contact equipment and weave poles. We will build confidence and drive as well as independence with these obstacles. This class may be taken at the same time as Agility Handling Skills. Pre-requisite: Introduction to Agility, dogs must be at least 12 months old. Six-week session teaching you and your dog agility handling basics such as front, rear and blind crosses along with other handling foundation skills to navigate sequences. Handling brings you and your dog together to form a great partnership. This class may be taken at the same time as Agility Weaves & Contacts. Pre-requisite: Advanced Beginner Obedience or Advanced Attention, **this class is appropriate for puppies as well as adult dogs. Six-week session bridging the gap between the foundation and upper level classes. For dogs ready to work sequencing but may not be performing equipment at full height or doing closed poles. Pre-requisite: Agility Weaves & Contacts plus Agility Handling Skills. Six-week agility session for more advanced dog and handler teams. We will work on longer sequences and continue to add to the tool box of handling skills. Pre-requisite: Agility Sequencing or dogs are working confidently on full height equipment and closed weave poles. Six-week agility session for teams competing in agility. We will work portions of courses and more advanced drills. Hone your timing and teamwork with your dog to achieve all of your competition goals. Pre-requisite: Advanced Agility. 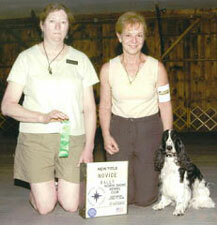 Six-week session introduces the requirements of all exercises required for AKC Novice Rally Competition. Pre-requisite: Obedience training, Attention or Instructor approval. 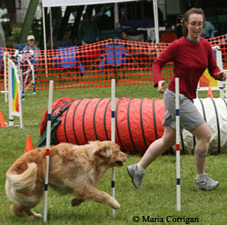 Six-week session introduces the requirements of all exercises required for AKC Advanced and Excellent Rally Competition. Pre-requisite: Rally Level I. Six-week session improves handling skills in all exercises, teaches competition strategy, walking and navigating courses, and practicing in trial-type setting. Pre-requisite: Rally Level II. Therapy Dog training is designed for people with stable, well trained dogs who are committed to volunteering on a regular basis for visits at hospitals, rehab centers, assisted living facilities, and reading with children programs. The session includes 6 classes meeting every other week which instructs all exercises required for Therapy Dog evaluation. Pre-requisite: Beginner Attention and Advanced Attention, no exceptions. We run one training session in the Spring and one training session in the Fall. Six-week session of half hour classes designed to teach you to stack, gait, free bait your dog and show him to his Championship and beyond! Pre-requisite: Puppies 12+ weeks of age, appropriate puppy vaccinations, accustomed to leash walking. Six-week session that introduces you to the sport of canine musical freestyle - "dancing with your dog". Learn basic freestyle moves and start to choreograph them to music. Pre-requisite: Advanced Attention. Six-week session for dog & handler teams to hone clicker skills and learn new tricks. Tricks are a great way to build a better relationship with your dog. We will work on tricks that will help in Agility, Rally and Obedience skills. Pre-requisite: Beginner Attention, Advanced Beginner Obedience or Introduction to Agility. Our instructors are available to conduct private lessons in any of these areas to address specific training needs. The timing is flexible to meet the needs of our students.